We choose our favorite necklace to perfectly complete an outfit. We slide on our favorite ring to remember our special day. We wear our favorite bracelet because it makes us think of a good friend (or we just like to hear it jingle when we move). And we add our favorite earrings for a little pizazz. But what do we do when our favorite jewelry betrays us? When it leaves behind a red, itchy rash? Unfortunately, if your jewelry is leaving behind a rash, that means you have a jewelry allergy. Here’s what’s happening to your body and what you can do about it. What Is a Jewelry Allergy? Jewelry allergies happen because you’re allergic to one or more metals in the jewelry that touches your skin. This allergic reaction is even more pronounced with piercings. Because the metal is going through the skin (not just laying on top of it), the reaction is stronger. What Does A Jewelry Allergy Look Like? An allergic reaction to metal looks similar to an allergy like poison ivy. You’ll notice redness, bumps, and/or blisters, and it feels itchy and irritated. It can look like other allergies but we know it’s jewelry because of the placement. With a jewelry allergy, the rash appears on the exact same place where the jewelry touched the skin. If you’re allergic to a ring, you’ll see a rash ring in its place when you remove it. If you’re allergic to a necklace, you’d be able to follow a rash line exactly where the necklace touched your skin. What Metals Cause Allergic Reactions? People can be allergic to any metal. Nickel is the most common metal allergy — that’s why you’ll notice many earrings labeled “nickel-free.” But nickel is not the only metal that results in an allergic reaction. Any metal can cause an allergic reaction, even gold. Maybe you’ve heard someone advise, “Buy 18-karat gold because it’s pure and you can’t be allergic.” Not true. A gold allergy isn’t very common, but your body can still react to it if you’re allergic. No matter the metal, if you have a jewelry allergy, the rash usually looks the same. If all of these descriptions sound a little too familiar, you’re probably wondering what to do. Do you have to just stop wearing jewelry? 1. Stop wearing the jewelry. If you suspect a particular piece of jewelry is causing a reaction, stop wearing it temporarily. 2. Use a steroid cream. Apply a cortisone (or another anti-inflammatory steroid cream) to the rash to help it heal. 3. Wear the jewelry again. Once the rash disappears, wear the jewelry again and see if it causes another rash. If it does, you’ll know you’re allergic to a metal in that piece of jewelry. What If the Rash Won’t Go Away? If the rash doesn’t disappear on its own or with a little help from an OTC steroid cream, it’s time to visit the dermatologist. They’ll be able to provide a stronger prescription to clear up your rash or help you identify another potential source of the problem. What Jewelry Is Safe to Buy? Since nickel is the most common metal allergy, avoid it. We highly recommend nickel-free jewelry. Sterling silver and 18-karat gold work well for most people. However, 18-karat gold is a soft metal and often they have to add other metals to it to harden the final piece. Make sure they didn’t add nickel or other metals that cause your skin to react. Earring reactions can be some of the trickiest issues to solve. Because the metal goes through the skin, we often react more strongly to it. 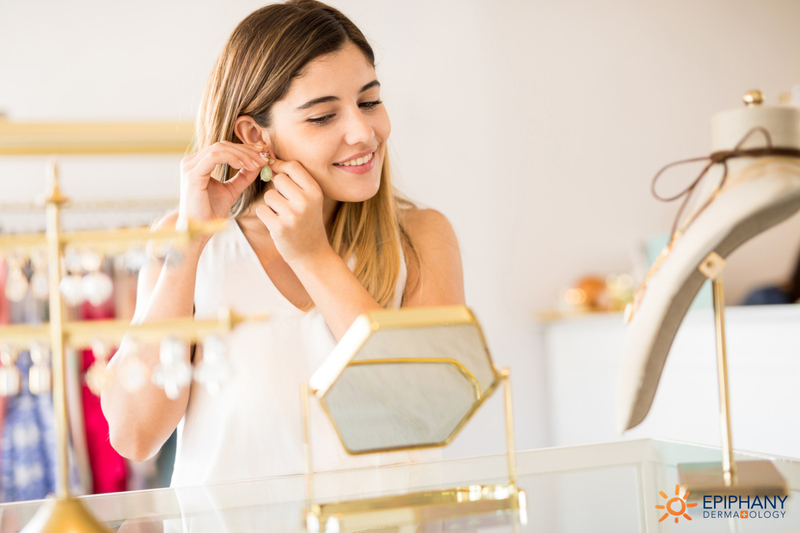 If 18-karat gold, nickel-free, and other “sensitive-labeled” earrings still cause a problem for you, consider trying open hoop earrings like Designer Ears. No, they aren’t clip-ons. We know clip-ons can hurt, even after a few minutes. These hypoallergenic earrings are designed to attach without going through your ear. You simply put it on like an ear cuff, then slide it down over your ear. I wear them and many of my patients wear these all day with no allergic reaction at all. Bonus tip: If you’re allergic to one of your favorite small jewelry items, like a ring, you can coat the part of the jewelry that touches your skin with clear nail polish. That will keep the metal itself from coming into contact with your skin until you can replace it or find a more permanent solution. Jewelry allergies are irritating… literally. Not only is our skin uncomfortable, but we also have to give up some of our favorite pieces or find a way to get the metal replaced. We know it isn’t fun — but neither is a rash. Dr. Moranz is a board-certified dermatologist in Albuquerque and Rio Rancho, NM, with over 27 years of experience. 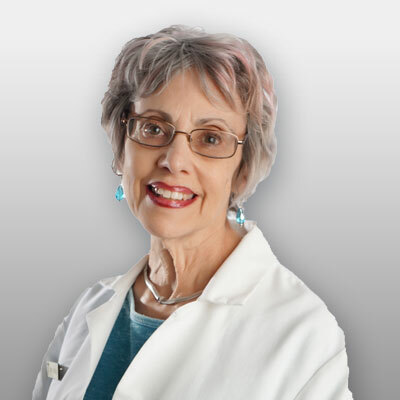 Dr. Moranz has also taught dermatology in her capacity as Clinical Instructor at the University of New Mexico School of Medicine’s Department of Dermatology. Outside of work, Dr. Moranz enjoys spending time with her husband, two dogs, and traveling. Learn more about Dr. Moranz.